Over more than fifty years of marriage, I have witnessed my wife, Eva, perform gestures of friendship for a wide variety of people. From cooking soup for ill friends, to inviting an 89-year-old Holocaust survivor to our home for Jewish High Holidays and for Thanksgiving, to finding a housekeeper for an aging couple, to planting flowers in a nearby friend's garden, I've seen Eva repeatedly go out of her way to make others' lives a little bit easier and happier. During my own busy career as a neurologist, I served as a facilitator for many such acts-especially in the role of chauffeur-but I never initiated them. I must have told myself that I was too busy with my "important work." Then, after 30 years of running a busy clinical practice, I retired and found myself with more free time than I'd ever known. After beginning a regular exercise routine, chauffeuring our grandchildren to various activities and enjoying plenty of recreational reading, I still had plenty of time left over. One morning while in the shower, where I seem get my best ideas, it occurred to me that perhaps I'd try to reconnect with my friend and colleague, Bob. Now 90, he had served as a mentor to me when we both served on the board of a healthcare trust and now lives in an assisted living retirement community near Philadelphia. He is restricted in his ability to get out and around because of his wife's Alzheimer's disease. For 40 years, he had served as the CEO of Pennsylvania Hospital, America's oldest healthcare institution, established by Ben Franklin in 1751. On several occasions, I'd made hospital rounds with Bob and observed how he greeted doctors, nurses, housekeepers and janitors by their first names, and on one occasion had said to a nurse, "Dorothy, I saw in The Philadelphia Inquirer that your husband won the tennis tournament in Conshohocken." I still remember how she'd beamed. I called him and asked if he would welcome a visit. He said: "I'd just love it, Larry." Thus began my monthly drives from my home in Allentown, Pennsylvania to Bob's retirement complex in Gladwyne, about 60 miles away. We'd go to the dining room for coffee and reminisce about old times and the remarkable people he met during his decades as hospital CEO. He recalled critical young hires he had made and how he watched them grow in stature over the years. Bob always speaks softly and I find myself leaning forward to hear him, but as one might paraphrase the old the E.F. Hutton commercial, "when Bob speaks people listen." Sometimes, I bring along a care package of goodies from Eva, including her famous mandel bread, the Eastern European version of biscotti. Bob relishes them, and never fails to send a thank you note back home with me. I then added regular breakfasts with another mentor, Ed, also 90, who served with me on the same healthcare trust and is the retired CEO of Air Products and Chemicals Inc., an Allentown-based corporation with 20,000 employees in 50 countries. We meet at the Perkins Diner right next to his assisted living facility in Bethlehem. While we eat pancakes and scrambled eggs, he shares stories of his remarkable life. I remain amazed at how this man who grew up in a log cabin in rural Michigan, a member of a farm family, rose to become one of America's most successful Fortune 500 executives. I watched him lead the effort to establish the first hospice in Pennsylvania, as well as take a leading role in other health care projects. Then again, it's not hard to figure out why he has been so effective and successful. He's very smart, but that's only the beginning. When Ed is speaking to you, you get the distinct impression that to him, you are the most important person in the world. 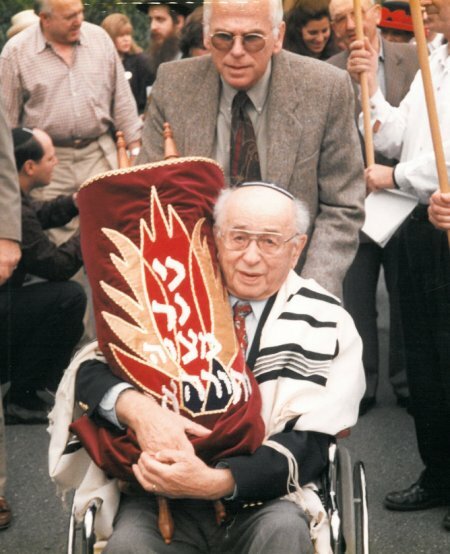 A couple of years after reconnecting with Bob and Ed, I began to take Leopold, my beloved father-in-law, to synagogue each Saturday morning. Since he would not ride in a car on the Sabbath, I pushed him in his wheelchair to and from the synagogue, about two miles from our home, where he spent his latter years after his wife passed away. For me, at least, the time flew, as we talked about the "old country" of Czechoslovakia, his comfortable life there before World War II, his harrowing experience at Auschwitz during the Holocaust, his wife, Olga and my wife ,Eva, having their lives saved by a Catholic couple, and, finally, the rigors of starting a brand new life in America. I learned much about persistence and optimism during those talks, as Leopold described how, after unspeakable hardship, he picked himself up, found work as a butcher in Brooklyn and for the benefit of his family, cheerfully put in 16-hour workdays and then driving Eva to her evening dancing lessons. One of his favorite expressions was: "Do the right thing and don't expect anything in return." He died in bed in our home at age 95. Then, three and a half years ago, I unexpectedly found myself in need of help from others. After decades of excellent health, at age 69 I was diagnosed with prostate cancer. "You need to undergo a radical prostatectomy," my doctor told me. In most respects, the operation went well. But just a few days post-op, I went into "urinary retention," which basically meant that I was unable to pee-a situation that is terribly painful and likened to childbirth. I wound up in the emergency room with a temporary catheter. My physician warned: "This could happen again at any time." One month afterward, I was scheduled to give a talk in Salt Lake City, Utah, to a international medical audience on patient-centered care, as a result of a book that I had co-authored. I was thrilled with the invitation because the thrust of the conference was that the patient should be the primary focus of medical encounters--exactly the idea that our book tries to convey. However, all I could think of was that in the middle of the talk I would suffer yet another attack of urinary retention and have to be rushed to a local emergency room for catheterization. Do I go to Salt Lake City on the chance that I'll stay healthy and reach a terrific audience for my book's message, or do I prioritize my health and cancel? As I was anxiously contemplating my options, the phone rang. It was my friend, John, a retired urologist. In an earlier conversation with him, I'd mentioned that I was struggling with this difficult decision. "Hey, Larry," he said. "How's it going?" "Nothing for me," he replied," but perhaps I can do something for you. I know how worried you are about going to Salt Lake. So, I've decided to fly out with you. I'll bring a catheter along so in case you get into trouble, I'll be there to help." I was dumbfounded. "John, come on," I said when I finally found my voice. "You don't have to do that." "I know," he said cheerfully. "But I want to." Fast forward: We flew to Salt Lake, I gave my talk to an enthusiastic audience, and I never went into retention. We had a lovely time to boot, including a tour of the Historic Temple Square accompanied by lovely Mormon guides, a visit to the Family Search Center which contains vast amounts of genealogical data, and an evening listening to the Mormon Tabernacle Choir. What remains most memorable about the trip though, is John's extraordinary gesture of generosity and friendship. He even refused my offer to pay for his plane ticket! Even now, I find it hard to believe what he did. I ask myself: Would I have done the same for a friend? Several months later, my wife, Eva, left for Ethiopia for a weeklong trip with our son, Marc, and his surgical team from Cincinnati Children's Hospital. There, he performed surgery on infants and children born with anorectal malformations; the operation allows these children who wore colostomies to gain control of their bowels. On this mission, Eva was serving as patient coordinator. In addition to her clothes and passport, she brought a bag filled with stuffed animals and candy for distribution to the hospitalized children. On my first morning alone in Allentown, the phone rang at 7 o'clock. Of course, I recognized her voice immediately. Judy and her husband, Alan, have been dear friends of Eva's and mine for 40 years. We spend every Monday night together, sharing dinner and watching a Teaching Company educational tape on topics ranging from Churchill to Michelangelo to Mozart. "How are you doing with Eva away?" asked Judy. "Anything you need?" "I think I'm fine, Judy. But it's great to hear your voice." We chatted for a bit, and I felt energized by our conversation. Judy called me every single morning that week, with variations on the same question: "What can I do for you today?" "How about dinner? Do you need bread or milk?" I also received multiple invitations for dinner by other friends, each gestures of concern and friendship. Each such meal was specially prepared with food that I particularly like, such as roast chicken or lamb chops. I seem to gain a few pounds each time Eva is away! "What time do you want to be picked up? " The caller is either Ron, Mickey or Sam, touching base with me prior to our monthly book club or poker game. They know that I have seriously impaired vision in my right eye is a result of a retinal problem and thus can no longer drive at night. Like clockwork, I can expect such a call, followed by chauffeur service to and from the event. On the way home, we always recount the highlights of the evening, laughing and joking. My friends have squired me to and from meetings for 10 years, when I first developed my eye problem. Whenever I try to express my appreciation, they brush it off and make some wisecrack on the order of: "We live to serve, good sir." As someone who took much too long to discover the value of gestures of friendship, I realize now that such gestures, modeled for me by Eva, are now being paid back to me with dividends. I don't know quite why this is, except that when we put positive energy into the world, that energy seems to expand, deepen, and return to us. I do know this much: I am truly blessed.